On baking sheet lined with parchment, place pumpkin wedges and drizzle with olive oil, and season with salt and pepper. Bake pumpkin for 20 minutes until cooked, but still firm. Remove from oven and let cool, then remove skin and cut into bite size cubes. Cook pasta in salted boiling water until just al dente. Then drain, rinse, and set aside. In sauce pan over medium high heat, melt butter and add flour. Whisk together to make roux. Add 2 cups milk and the rosemary and whisk until smooth. Add another cup of the milk and continue to whisk. Cook for 5 minutes while whisking continuously. Add grated cheese and stir well. Season with salt and pepper followed by the pumpkin puree and nutmeg. 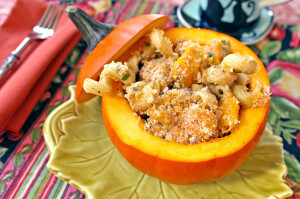 Then remove from heat and toss sauce with pasta and cubed pumpkin pieces. In a small bowl, mix together the panko, garlic powder, onion powder, cayenne, and parmesan. Butter a baking dish and fill with pasta and sauce. Top with panko mixture. Bake in oven at 425°F uncovered for 10 minutes until panko mixture is just crisp and golden. 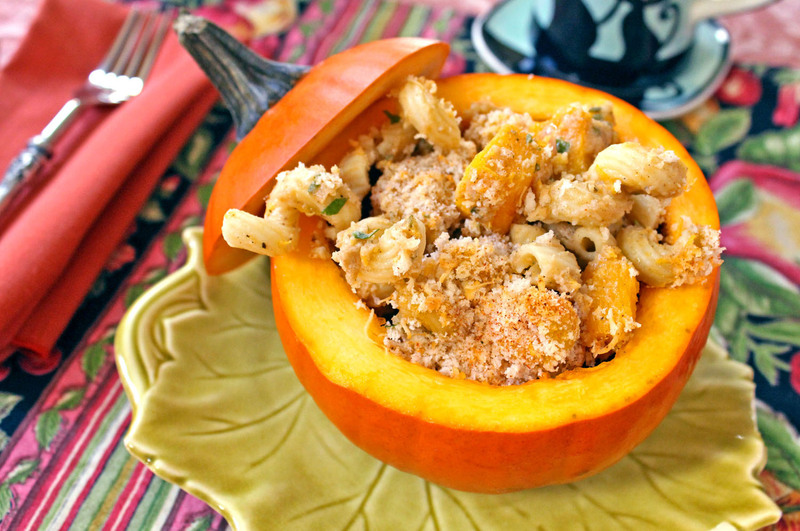 This entry was posted in Cooking, Fall, Main Dishes and tagged Cheese, Pasta, Vegetables by cfaust. Bookmark the permalink. mmmmm….looks tasty and just right for this season and into the holidays. BTW, love your table setting !